Virtually all states require auto manufacturers to sell new vehicles through local franchised dealers, protect dealers from competition in Relevant Market Areas (RMAs), and terminate franchises with existing dealers only after proving they have a “good cause” to do so. These state laws harm consumers by insulating dealers from competition and forestalling experimentation with new business models for auto retailing in the twenty-first century. A pro-consumer policy would make franchising, exclusive territories, and termination protections voluntary rather than mandatory. Under voluntary contracting, these business practices could still survive when their benefits to consumers exceed the costs. The first automobile franchise was established by William Metzger, who purchased the right to sell steam engine cars by General Motors in 1898.1 What started as a voluntary agreement between a manufacturer and a retailer has turned into a mandatory requirement in all 50 states and in US territories.2 State auto franchise laws extensively regulate the contractual obligations between manufacturers and dealers. They prevent manufacturers from selling new vehicles (and related services) directly to the public, often mandate exclusive territories for dealers, and make it difficult for manufacturers to terminate dealers. State auto franchising regulations have become ubiquitous during the past three decades. 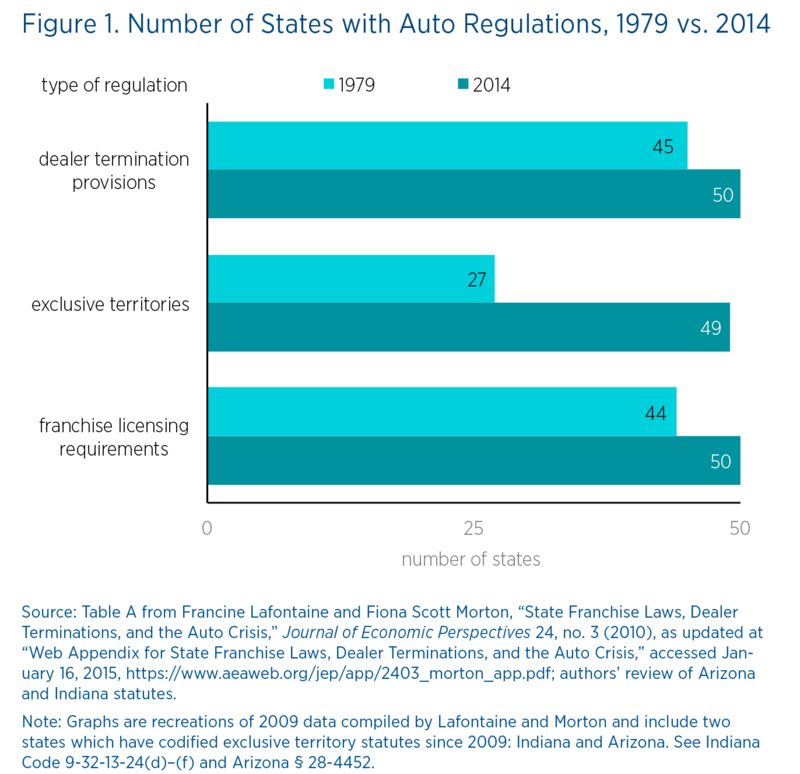 As figure 1 shows, all three types of laws—franchise licensing requirements, exclusive territories, and dealer termination provisions—became more common between 1979 and 2014. During those 30 years, states enacted 31 new laws on those topics. In 1979, fewer than half of all states regulated all three aspects mentioned above. By 2014, all but one state regulated every single one of these aspects. Although states have ramped up dealer protection, two recent policy controversies have called these laws into question. Electric automaker Tesla has sought to sell automobiles directly to the public, and federal supervisors of the Chrysler and General Motors bailout pressured the automakers to terminate numerous dealerships. Franchising, exclusive territories, and dealer protection from termination can benefit consumers when they are adopted voluntarily by manufacturers and dealers. Auto dealers provide valuable services to consumers that some manufacturers are unwilling or unable to provide. These services include holding inventory, offering test drives, accepting trade-ins, and auto servicing and maintenance. Since state laws require manufacturers to sell new vehicles through franchised dealers, manufacturers cannot sell directly to the public.15 This requirement prevents new manufacturers, such as Tesla, from establishing factory-owned dealerships. Tesla’s direct sales model could improve the dealership experience for consumers interested in purchasing an electric vehicle. A McKinsey analysis of the auto industry estimates the percentage of consumers who purchased a new vehicle and left the dealer dissatisfied with their experience at a relatively low 25 percent.16 Researchers at the UC Davis Institute of Transportation Studies, however, found that 83 percent of customers in California who purchased an electric vehicle were dissatisfied with their dealer experience.17 While it may work fine for many customers buying traditional vehicles, the franchise system may not provide a satisfactory experience for a significant number of consumers hoping to purchase an electric vehicle. Mandatory franchising also prevents established manufacturers from selling directly to the segment of consumers who might prefer to avoid the dealership and simply order a car from the manufacturer, the same way many consumers buy built-to-order computers from manufacturers. Gary Lapidus, formerly a US auto industry analyst for Goldman Sachs, estimated that a build-to-order system could save consumers $2,225 on the price of a new car, based on an average price of $26,000 per car.18 A position paper prepared for the National Automobile Dealers Association (NADA) disputes this figure, labeling it “a math exercise that assumed that such expenses would vanish in a direct distribution model.”19 Since manufacturer direct sales are illegal in all 50 states, neither manufacturers nor consumers have the opportunity to find out. RMA statutes help insulate dealers from competition. Without the threat that the manufacturer might open other competing franchises, existing dealers have the opportunity to charge consumers higher prices.24 Since almost all states now have RMA laws, it is difficult to estimate how RMAs affect prices today. In the mid-1980s, when RMAs were less prevalent, Federal Trade Commission economists estimated that they increased the price of new cars by approximately 6 percent.25 The percentage is arguably lower now, because the Internet has increased competition between dealers. A 2001 study found that Internet referral services save consumers about 2 percent on new car purchases26—a figure consistent with the hypothesis that the Internet has reduced, but not eliminated, the price-increasing effects of RMA laws. In short, state auto franchise regulations institutionalize anticompetitive pathologies.34 We do not claim to know the optimal way of organizing auto distribution and retailing for the industry as a whole or any individual automaker. NADA’s previously mentioned position paper argues strenuously that the current system of franchised dealers will always out-compete a system of manufacturer-owned dealerships.35 If this is true, the current franchise system should not need the legal protection it enjoys in every state.